CARDIFF PHILHARMONIC ORCHESTRA are set to open their most exciting season yet with a helping hand from a Hollywood A-lister! 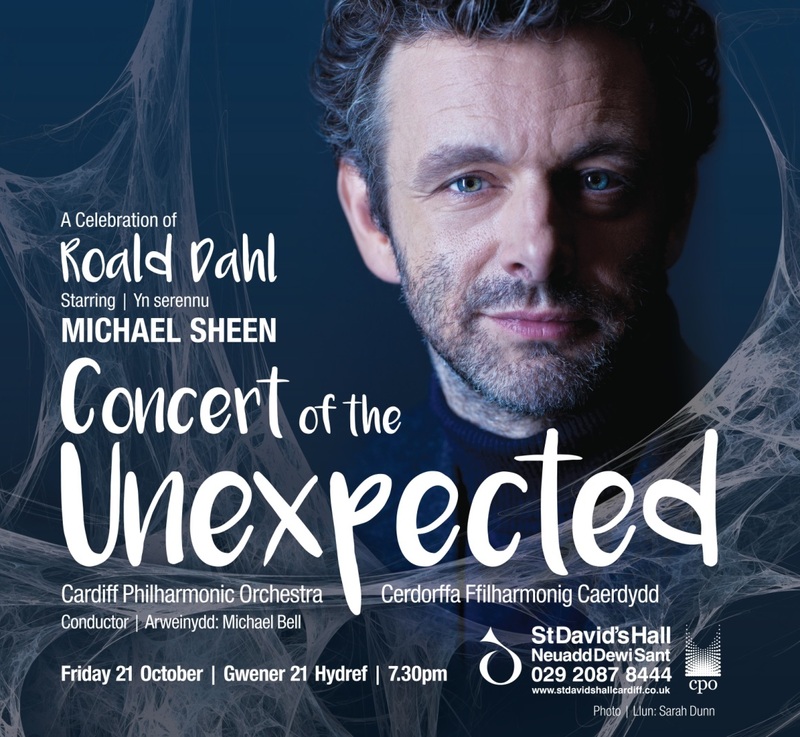 Iconic Welsh actor and director Michael Sheen OBE will be the special guest narrator in Concert of Unexpected: A Celebration of Roald Dahl at St David’s Hall on Friday 21 October. Michael will narrate the World Premiere of a work entitled Mr Dahl, which is based on the legendary author’s wonderful and whimsical life. The captivating piece is written by respected Welsh composer Bernard Kane Jr, who has collaborated with the likes of Manic Street Preachers, Bryn Terfel, Sir Karl Jenkins and Catrin Finch to name just a few. This magical family concert continues the huge 100th birthday celebrations following the staggering success of the City of the Unexpected weekend last month, which marked the centenary of Roald Dahl’s birth in Llandaff in 1916. The rest of the programme outlines Dahl’s war years as a pilot (Walton’s Spitfire, Prelude and Fugue); his Norwegian roots (Grieg’s Peer Gynt Suite) and one of his most popular tales (Charlie and the Chocolate Factory). Also sharing the stage with Cardiff Philharmonic Orchestra are members of 2016 Principality Only Boys Aloud Academi with Aled Powys Williams. Plus, there’s now a fascinating pre-concert talk entitled The Magical Mind of Mr Dahl onstage in the auditorium as Peter Morgan Jones speaks with Michael Sheen, Bernard Kane Jr and Roald Dahl biographer Donald Sturrock (author of Storyteller: The Life of Roald Dahl and Love From Boy: Roald Dahl’s Letters to His Mother), who share their favourite thoughts, memories and insights of the iconic author. Experience the magic of Roald Dahl with Cardiff Philharmonic Orchestra and Michael Sheen at St David’s Hall! Please note, although the start time of the event remains 7.30pm, the actual performance from Cardiff Philharmonic Orchestra will begin at the later than previously advertised time of 7.50pm and be preceded by a 20-minute pre-concert talk onstage in the auditorium. Under 16s are £5*, whilst tickets for 16-25 year-olds are £7* (proof of age required). *All tickets are subject to a £3.95 Ticket Service Charge per transaction and an optional 95p postage fee).